Well… yes, a bit, but not for long! Climbing aboard their bikes, the trio set off on a summer road trip to Paris, their goal: a garden party with the French president. As news of their trip spreads they become stars of social media and television. With the eyes of the nation upon them the girls find fame, friendship and happiness, and still have time to consume an enormous amount of food along the way. Fifteen-year-old Mireille has had the honour of coming first two years running in her school’s annual ‘Pig Pageant’, a horrible Facebook competition to find the ugliest girls in the school, started by her ex-best-friend Malo. But this year she comes third: first place goes to Astrid, a new Year 11 student and second place goes to Hakima, a Year 8 girl. 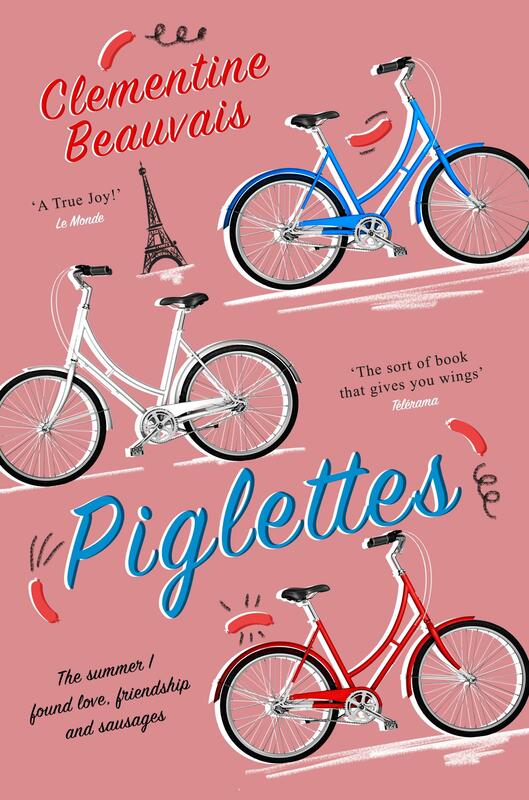 The girls meet up and Mireille decides that since they all (each for their own reason) want to be in Élysée Palace in Paris for the Bastille Day Celebrations, why not all cycle there and sell sausages on the way? Calling themselves ‘The Three Little Piglettes’ and accompanied by Hamika’s older brother Kader (a double amputee and ex-soldier), the girls do just that. Unfortunately, journalists are following the progress of the Three Little Piglettes and for every good comment under the articles published there is an awful, sickening one. Mireille claims to be so used to people calling her ugly, it’s all water off a duck’s back – and for the most part, this is true. But when it does hurt, Mireille pushes the pain to the side and refuses to let people see how it affects her. This is an absolute gift to us readers, because we get to see how that affects those trying to hurt her. When that scene finally came, it felt shamefully good to read. You can’t have a book about teenage girls’ bodies without getting political. While it does come up (Mireille thinks calling yourself a Piglette is ok but calling yourself a feminist is just asking for trouble), the girls refuse to let their quest turn into anyone else’s political statement – determined to do things their own way, for their own reasons. On top of all this, Piglettes is just plain funny! Mireille is hilariously dramatic in everything she does. Clémentine Beauvais is like a less boy-obsessed, slightly quirkier and French Louise Rennison, for today’s generation. I loved this book! For ages 12+.